This post has been reserved for the final build. This project is pretty special to me. I remember myself reading a 1998 computer magazine article about then upcoming Pentium II Xeon processors for workstations and servers. With the price of $3692 for just a single CPU, they seemed unattainable as much as they were ridiculously overpriced. Sure, they were never meant for end users, but for enterprises and that was the time a regular Pentium II was already a processor to dream of, the Xeon with its huge physical size and L2 cache, designed for all new Slot 2 was a completely different beast. For me, this first Xeon generation has always been almost mythical as I never happen to see or even hear about them again since that magazine article. About a month ago I stumbled upon this motherboard on a bulletin board. The guy marketed it as an old decommissioned server board. He made a lot of mistakes in the description, and for that reason, it could not be found by using keywords as Slot2, Xeon, 440GX. 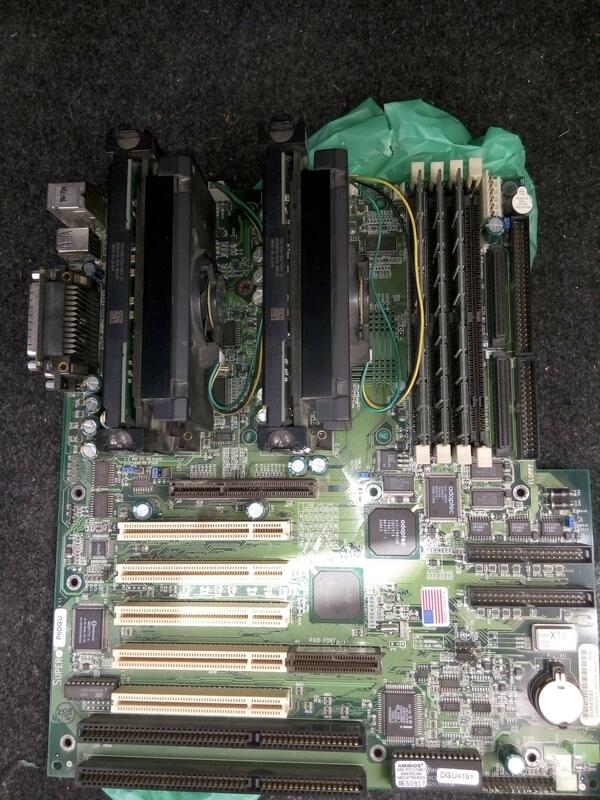 I came across it just by browsing around old motherboards for sale. So I immediately jumped on it. It was probably the fastest buying decision I have ever made. He told me the board was purchased by a local power plant in his city in 1999 as a base for scientific workstation. It came with a pair of 500/512K Xeon. And it is made in the USA. They even put a sticker saying that to the board. Which is cool. So now that the board is mine I'm deciding what kind of a computer I'd like it to be. I did some research and for the revision I have (v. 1.1) I can probably max it out with Cascades Xeon 900/2M, there is no official support for 900s though but I found few successful reports on forums here and there. Or step it down a bit with 700/2M which are supported officially. From the appropriate video cards I own, I can use GeForce256 (1999), GeForce2 GTS (2000) or GeForce3 (2001) Anything newer would probably be bottlenecked by CPUs. But that's we'll find out doing some benchmarks. I'm also going to compare the Xeons to regular Slot 1 Pentium II/III running on a per clock basis to find out how the increased cache affects the performance in various type of applications. I don't expect to see much of a difference especially in games however. I might end up acquiring 3dfx Voodoo 5500 as I feel like it matches the whole build uniqueness but honestly, I really don't think the 5500 was the greatest option back in 2000. I would rather have gone with GeForce2 Ultra back then. Which is now I'd say is on par with the 5500 in terms of rarity. Also I have some black pcb STB Voodoo2 and the green ones from Diamond. These cards were obsolete in the year 2000 but we'll keep them for the older games compatibility and SLI coolness factor. 2CPUs, 2GPUs. Yeah. For sound, given we have two ISA slots we can use Sound Blaster 16 or AWE64 Gold for DOS and something like Live!, Audigy or Vortex2 for Windows games. The case I've bought cheap for this build is a server one made by Intel. It's not 100% period correct and was made in 2002. I like the industrial look of it but it has very few 5.25 and 3.5 expansion slots, limiting my options to use Zip, Jaz, multiple optical drives and for this reason, I'll probably replace it later with something more suitable. But for now, I think it's alright. And it is much wider which would help fitting these tall Xeons. There were few issues fitting the motherboard. The case is designed to house 603/604 Xeon. I had to drill 4 holes and make threading to install CPU support brackets which actually mounts to the case through the board since each of these Xeons weights more than 2 lbs. This mounting method they later reused for the 771 Xeons I had back in 2009. The build is not up and running yet, I have a some things to be done, there are some major components on the way, so stay tuned. Last edited by Mike V8 on 2018-10-14 @ 23:21, edited 1 time in total. Duel CPU builds are getting somewhat common here, Xeon builds even with a single CPU as still pretty rare though, Nice! I stupidly killed a Slot 2 Compaq workstation many years ago. Still got the single 450Mhz CPU but given up on ever owning a working system. Sound wise, Id go with the opposite the other system is, so if that has a creative card put the Vortex in this. Plus ISA card for backwards compatibility. What'll you be using for storage on this? chinny22 wrote: What'll you be using for storage on this? Storage actually was the turning point I've decided not to do a 100% period correct build. Hard drives from that era are small size and noisy. This mobo has an onboard Adaptec SCSI on it, so the desicion to go SCSI was pretty obvious. No stupid limits in capacity IDE are known for, far more superior drive performance, Ultra2Wide SCSI bus throughput is 80MB/s vs. 33MB/s for IDE, up to 30 devices vs. 4 for IDE. it's a 15.000rpm drive with 146GB capacity. It's from 2006 and it'd be the most modern part of this build. Surprisingly, the drive is very quiet even by modern standards. It's not louder than your average 7200rpm contemporary drive. One thing to keep in mind though is cooling as 15.000rpm drives can get very hot. Also these drives tend to vibrate more. RAM-wise I'm maxing this thing out with 4x512MB PC100 ECC Registered memory for 2GB total. The motherboard is from 1998. 32MB was a decent amount back then, just like the 32GB is nowadays. Last edited by Mike V8 on 2018-10-14 @ 23:39, edited 1 time in total. Interesting build - I've never seen such a thing in real life. It's also pretty intriguing that the cpu packages are so heavy. Maybe Flex Magazine was running such machines. It could be? Any kind of adapter? The aux power connector our boards have is just a regular half-AT power connector that any P4-compliant power supply have. It's said in the manual this connector is optional and is recommended once you have a lot of expansion cards or power hungry graphics cards. I have another board similar to yours - Supermicro P6DBS and it runs great with a regular 24-pin power without this aux one. If your board is not stable I'd try to run it with the minimum cards connected, test the RAM or try a P4 PSU. I've been quite busy lately, I'll post the update soon! I have almost all the major components for this system arrived. I mean, the system was no stable during some tests, but now I'm using it with a proper-PSU with that extra power connector... and fortunately I have some psu spares. I have a Ultra X-Connect 400w PSU and the C440GX+ motherboard. I picked up the Ultra PSU because it says it has the 6pin Xeon Aux cable. However, upon receiving the PSU i found that the Xeon Aux connected is "keyed" differently than the connector on my MB. Were there multiple versions (pin outs) for these aux cables? Mike V8 wrote: I have another board similar to yours - Supermicro P6DBS and it runs great with a regular 24-pin power without this aux one. It is not a 20-pin ATX connector on this board? I can't see 24-pin. 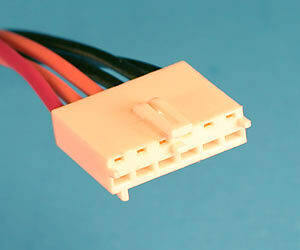 24-pin ATX connections, you will find them at ATX 2.2 specified mainboards. Sweet baby jesus, how did I miss this thread? Oh, well, damn. I hope Mike V8 comes back. luckybob wrote: Sweet baby jesus, how did I miss this thread? I hope he comes back too. Same here. Not enough Slot-2 builds.